The HVAC system is designed and built to save energy. It also provides a comfortable living environment (without hot and cold spots in some rooms). 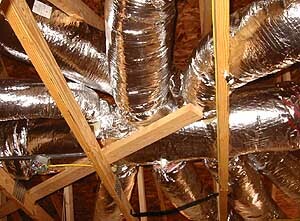 Up to 33% of heat can be lost through duct leakage alone in an average home. Our ducts, pipes and vents are carefully sealed to meet ENERGY STAR® requirements. (Most electric companies offer a discount on your utility bill for an ENERGY STAR® home). The goal of our home is to keep the loss at 5% or less. Our Duct Blaster and Blower Door Tests measure this performance (shown on next page). 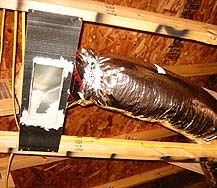 All the duct system is housed in the attic with blown-in cellulose insulation covering it for maximum energy efficiency. It is therefore important to ensure the system is built soundly to avoid future maintenance. All the ducts, pipes and vents are first wrapped in R6 insulation, then tightly sealed with Shurtape DC-181 from Hickory, NC. Shurtape is a lot more effective than duct tape, because duct tape doesn't hold up very well long term. 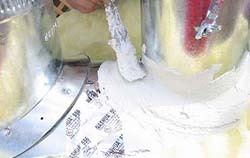 The vents, collars and connecting joints are sealed with mastic sealant to eliminate any air leakage. 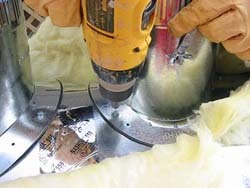 Mastic Airseal 33 by Polymer Adhesive, contains fiber and elasticity for expansion and contraction.